Comfort Designs provides features far above the industry standard. Features that solve issues and create benefits for the Owner/End User or Architect designing psychiatric care facilities. 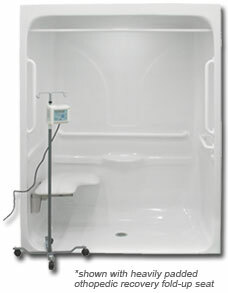 Surgical care equipment rolls easily into the shower area. With features such as the barrier free threshold and easy entry bar placement, the surgical recovery room package is designed to make bathing for the surgery patient easier and safer and less stressful for the caregiver. Padded seats and a molded soap dish are convenient and comfortable for post surgical care patients.